Mel Frank, the pen name of James J. Goodwin, was born in Lynn, MA, 1944. Goodwin served as a shipboard electronics technician in the US navy, 1963-1967. 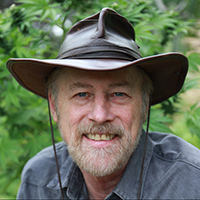 Upon completion of service, he moved to New York City, where he began growing marijuana in 1968. The Mel Frank pen name first appeared in 1971 in the New York Flyer of Rolling Stone, where he authored a two-part series on marijuana growing under fluorescent lights. After reading this series, Ed Rosenthal contacted Frank, convincing him to collaborate on a marijuana growing book, culminating in the 1974 publication of theMarijuana Growers’ Indoor/Outdoor Guide, by Level Press, San Francisco.